As noted in the post on the Washington Historical Society, a lot of Germans settled in this region. Actually, a lot of Germans settled all across the Midwest. 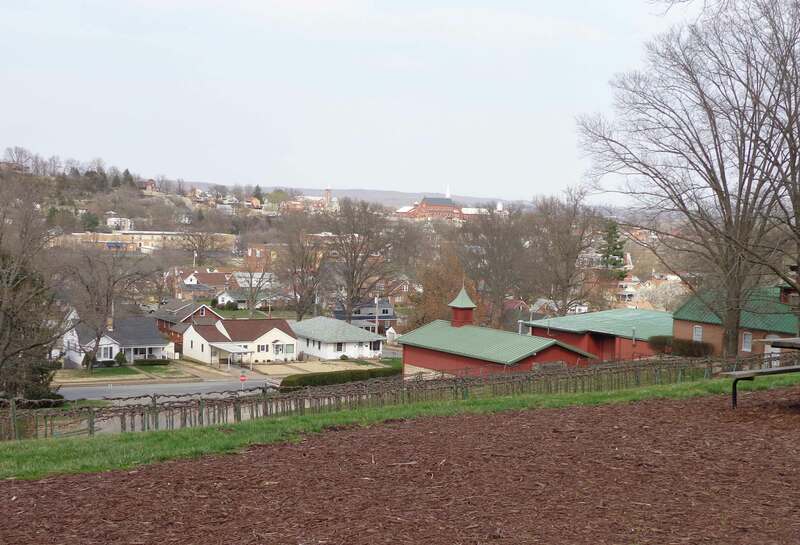 But in Hermann, it was more than just a large number of Germans happening upon the area; it was planned as a German town by the German Settlement Society of Philadelphia. 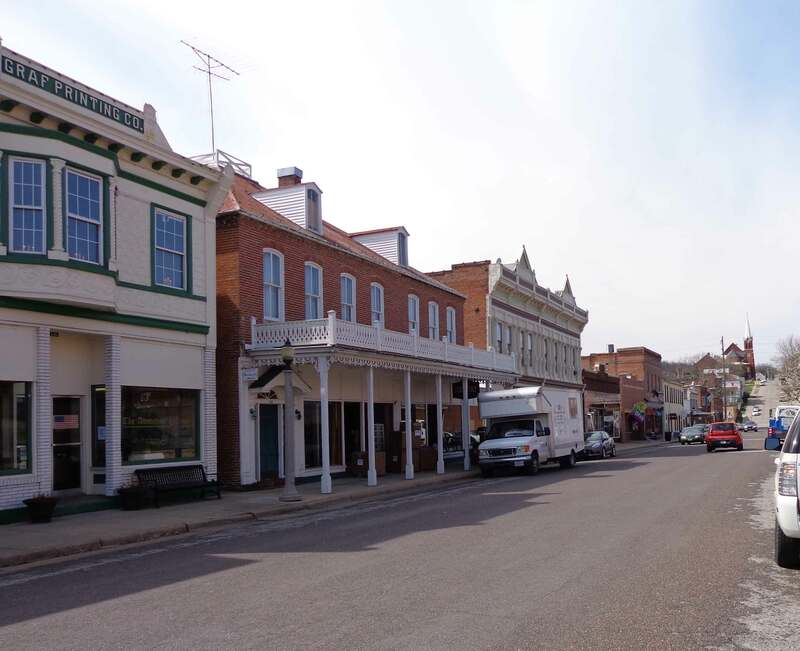 In 1836, land was bought and the town, which is sometimes called “Little Germany,” was founded. The town developed an important wine and grape culture, and before Prohibition, it was home to one of the largest wineries in the U.S. I was on my own for the day, but Ralph had suggested that I might enjoy Hermann and had given me directions on how to get here, as well as a couple of recommendations for lunch. So that’s where I headed. It was too early in the spring for the tourist-oriented activities, such as costumed interpreters at the Hermann Farm. But it didn’t matter. It was a lovely and clearly German old town, with delightful shops, wonderful architecture, and a lot of history. The hilly countryside and nearby river added to the location’s charm, as did the myriad flowering trees. 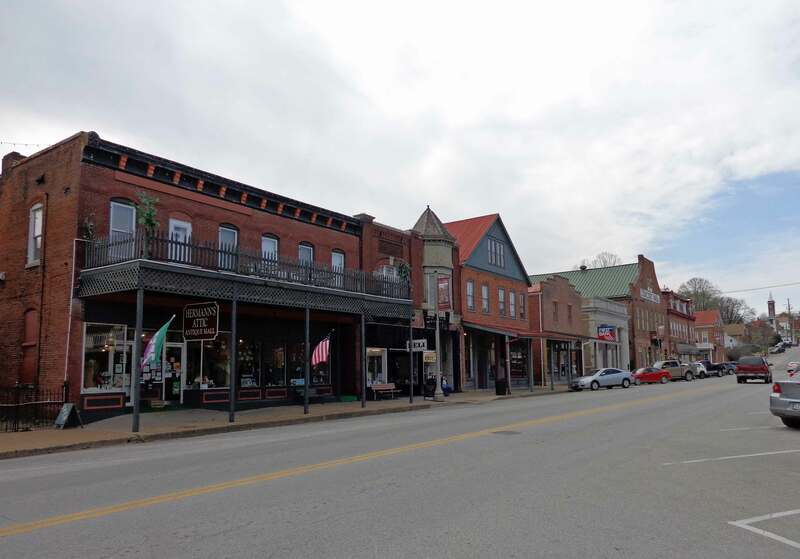 I drove around for a while, as Hermann sprawls a bit, but I eventually just parked the car and walked up and down the streets, enjoying the very European feel of the place. I did eventually take Ralph’s advice about lunch, heading for the Wurst House, a store and restaurant whose owner is an award-winning sausage maker. The interior suggested that the Wurst House handles large crowds during the summer season, but I was one of only two dining there today. 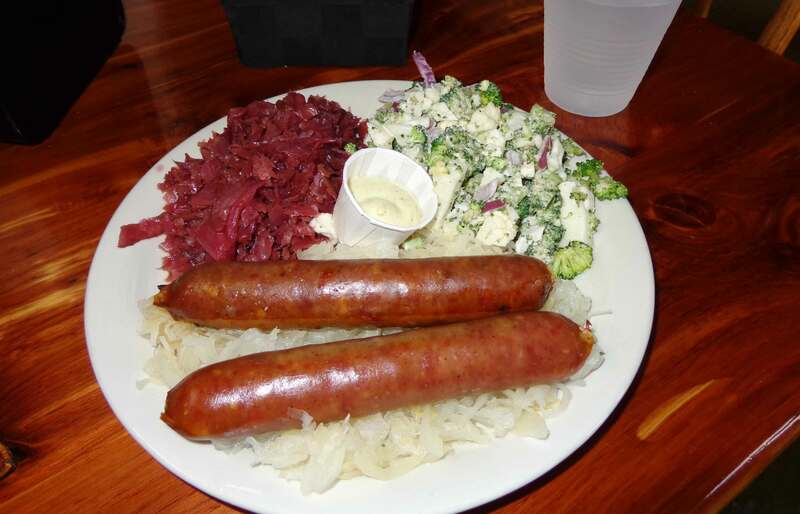 I ordered what was listed as the “German special,” which allowed me select two different brats from four on offer (I chose a mushroom with Swiss and a caramelized pear with gorgonzola), which were served on a bed of sauerkraut. I got to pick two sides, as well, and went with the broccoli and cauliflower salad and red cabbage. All was very good. The brats all have natural casings, so the texture was good, as well as the flavor. Before leaving, I found that they offered free samples at the back, and if I ever return, I’d probably go with the “Best of Show,” which was even better than the two brats I’d already had. Then I headed across town to the historic Stone Hill Winery. 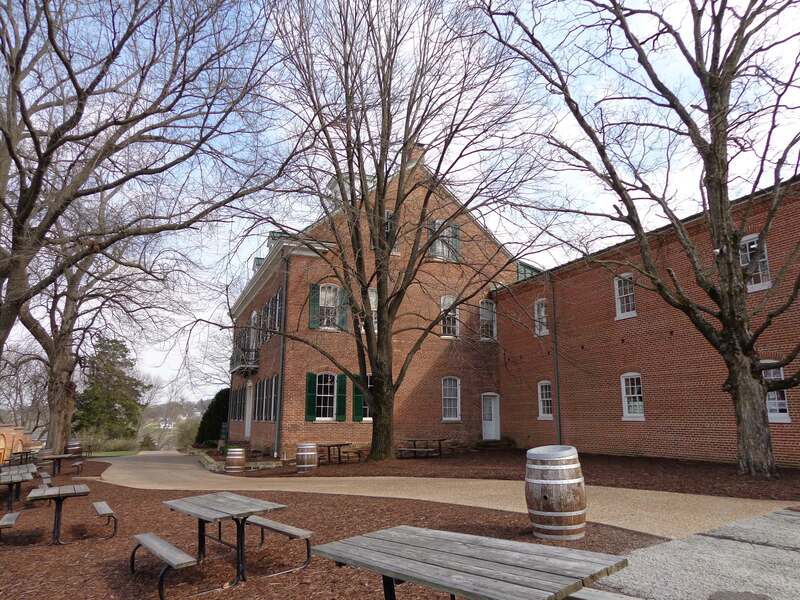 Established in 1847, this is among the oldest wineries in the country and is the oldest in Missouri. The winery sits atop North America’s largest series of arched, underground cellars, which makes it noteworthy, but its wines get a lot of attention, too—and awards. Of particular interest is the Norton grape, a historic grape that, in the 1800s, produced internationally acclaimed red wines. The Norton, once feared to be extinct, is the state grape of Missouri—and the fact that a state has an official grape tells you something about their attitude toward wine. The small patch of Norton grapes discovered at Stone Hill were planted around the time of the Civil War. There are not enough Norton vines to make wine every year, I was told, but they had one available for sampling. So happily, I got to sample this historic wine—and it was very good. Big red, incredibly smooth. And in case you think this sounds like a good story and should be in a book, it is: The Wild Vine: A Forgotten Grape and the Untold Story of American Wine by Todd Kliman (2011). Then it was time to head back to where I was staying, as I was giving a presentation that evening on the history of corn. Very attentive audience, which I guess is not surprising in a region where farming, food, and history are so appreciated. I’m heading to a wedding in Hermann later this month. Thanks for the review! That German food looks good. 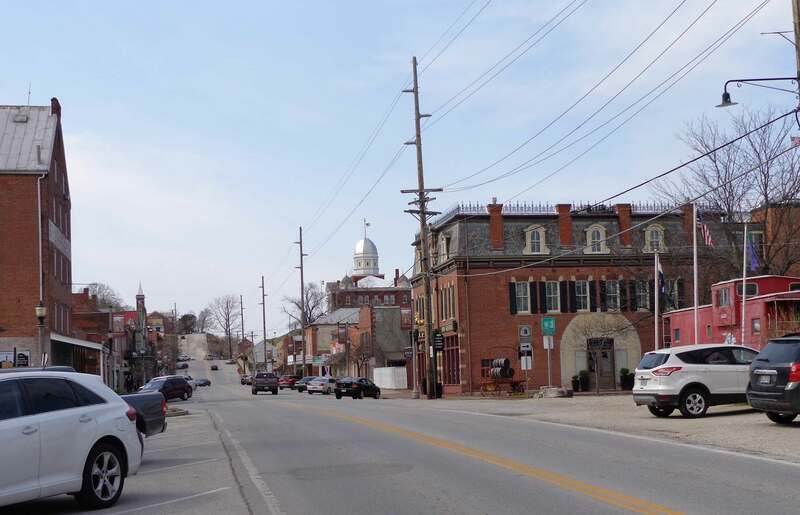 It’s a lovely town — and more things will be open when you’re there, as you’re going later in the spring. Hope you have a wonderful time. And while you’re in the area, there’s some fun history in nearby Washington (previous few posts). And I enjoyed your Voyageer site. We’re definitely in the same camp — travel whenever, wherever. You might enjoy my other two blogs, Waltzing Australia and The World’s Fare (links to the right). May inspire some other destinations.